Below is my Chase Freedom Card review. I actually have this card in my wallet and have had it for several years so this is my real personal experience. You can earn $150 after spending $500 in the first three months. Today, we’ll take a closer look at the “Chase Freedom Card,” which is probably the card issuer’s most popular credit card at the moment. First and foremost, Chase Freedom is a cash back credit card with no annual fee, which is its biggest draw. And my favorite combination for a credit card, assuming the rewards are lucrative enough. You earn 1% cash back on all purchases (1 point per $1 spent) with no minimum annual spend and no maximum to how many points you can earn. Oh, and the points never expire. Each point is worth a penny if redeemed for cash back, which is the industry standard. You also get an additional point for every dollar spent on airfare purchased through the company’s online booking tool. The only thing you don’t earn cash back on is balance transfers, cash advances, money orders, and traveler’s checks. On top of the everyday 1% cash back is 4% more cash back in rotating categories. Every three months, new categories are unveiled that allow you to earn a total of 5% cash back. Categories include things like gas, groceries, restaurants, and more. So cardholders may want to use the Chase Freedom credit card at certain places during specific times of the year to maximize their cash back. The only drawback here is that the 5% cash back is not unlimited. It’s maxed out at $1,500 per category, per quarter. So really the max bonus cash you can earn is $60 per quarter (6,000 points). That’s taking the 4% bonus amount on top of the 1% you already get for purchases 365 days a year. But if they presented it that way we wouldn’t all be so excited, would we? Additionally, you have to “activate the cash back” each quarter in order to get it. It’s not hard to do, but you still need to remember to visit the website and enter some pertinent details every quarter. As you can see, they break it down for you in your account activity rather nicely (and immediately) so you can see that you’re earning the 5x bonus points. They show the purchase total, then 4x the total and 1x the total, for 5x total points. If you’re bothered by limits, check out the newer Chase Freedom Unlimited, which as the name implies offers unlimited 1.5% cash back all year long. You can also earn 10% cash back when shopping with select merchants, such as Kohl’s, Drugstore.com, and many others, online via Chase’s Ultimate Rewards portal. So $50 in spending will net you $5 cash back. Not a bad deal at all if you already shop with the participating merchants. And if you’re particularly savvy, you can stack the rotating cash back categories with the portal savings to earn even more cash back. As far as redemption, you can redeem your points for discounted gift cards to places like Starbucks and Amazon, which allows you to maximize your points that much more. For example, redeem 4,500 Ultimate Rewards points for a $50 Starbucks gift card. Or transfer them to your Ink card accounts and then on to travel partners to stretch them even further. Speaking of cash back, you can get another $200 cash back from Chase Freedom if you spend just $500 in the first three months from account opening. That’s a very low spend requirement that I would guess most people could pull off with little if any trouble, even the most frugal credit card holders out there. Keep in mind that there are a lot of offers and links out there that only come with $100 bonus cash back, so make sure you navigate the application process carefully. There is one important difference though. The $200 cash back offer may not come with introductory 0% APR. The credit card APR could start at a variable 12.99% to 22.99%. There is also a $100 cash back bonus offer, which comes with 0% APR for 15 months on both purchases and balance transfers. But with the 3% balance transfer fee, it’s not the best credit card for balance transfers. (See the Slate No Fee Balance Transfer for more on that). Update: The Chase Freedom$200 cash back offer now comes with 0% APR for purchases and balance transfers for 15 months! Another cool feature associated with Chase Freedom is the annual 10% bonus on points earned throughout the year. This is similar to the Chase Sapphire 7% points dividend, which is being phased out. It’s available to those with a Chase checking account (sole or joint owner). This makes all your standard points worth 1.1 cents, as opposed to just one cent. It also increases your five points earned to 5.5 points, as you get the 10% bonus on the 5% cash back categories as well. Your 10% annual bonus is calculated after your billing cycle with a December closing date, and the bonus points will appear with your January or February billing statement. Keep in mind that you will not earn the 10% annual bonus on sign-up bonus points, points transferred into your account, or on previous 10% bonus points, obviously. Tip: Did you know that you can book a round-trip airline ticket valued at up to $335 for just 25,000 points (normally only $250 value) via Chase’s toll-free number (1-866-951-6592). This is yet another hidden Chase Freedom benefit! 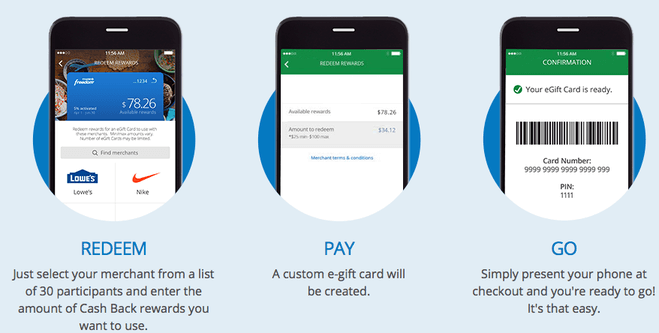 Recently, Chase launched a mobile app for the Freedom card, which among other things, allows cardholders to redeem their points on the fly at a number of participating merchants. The way it works is pretty simple. You select a merchant from the list of participating stores, enter the amount of cash back you’d like to use, and then a custom e-gift card is created instantly. From there, all you have to do is hand your phone to the clerk and they’ll be able to process it for you. Currently, this works at places like Target, Sears, Starbucks, Best Buy, Gap, Lowes, and many other megastores. Overall, the Chase Freedom credit card is a great choice for someone looking to maximize their cash back without being subject to an annual fee. And with so many opportunities to get bonus cash, along with the numerous redemption options available, it’s hard to beat this credit card. It also comes with Blueprint technology, just like the Chase Slate credit card, which helps cardholders manage their spending and pay down balances more efficiently. Of course, you should never really carry a balance if you can help it. At the same time, the rotating cash back categories can be a bit of a drag, especially if the chosen categories don’t appeal to you. And the cash back limits are pretty weak, as mentioned. So it’ll probably make sense to carry an everyday cash back credit card to supplement the Freedom card. Options include the American Express Blue Cash card or the Bank of America Cash Rewards credit card. Both offer cash back year-round without the need to sign-up. But I do believe it’s a good credit card for most consumers, especially those that don’t spend that much on their credit card. Why? Because you can still earn $200 just for spending $500 in three months. Full disclosure: I didn’t actually apply for the Chase Freedom card. My Chase Slate card was automatically transformed into a Freedom card without my consent. However, they offered me 20,000 bonus points if I spent just $500. I took them up on the offer, obviously. That’s easy as pie. Additionally, I like the 10% bonus on points earned because I have a Chase checking account. Unfortunately, that feature is being phased out in a year, but until then I’ll take it. Lastly, I like the 5% cash back categories Freedom offers, and Ultimate Rewards points can be transferred to my Ink card accounts where they get more mileage (literally) through partner redemption programs. All that with no annual fee just makes sense to keep in my wallet for the long haul. This card was awesome for the 10% cash back at Amazon. I love the rotating categories because they’re ones I actually use! Which is better, Chase Freedom or Freedom Unlimited? Depends, main difference is Unlimited is 1.5% on everything but no 5% rotating categories. If you use the categories you can potentially do better earning 5% on most purchases, then use a 2% cash back card for other stuff.